My wife and I were eating on the deck at Lower Sabie when this cheeky Kokariba (Tswana name) very nonchalantly helped himself to my french fries! In this photo he is waiting for a chance to launch another 'attack'...! 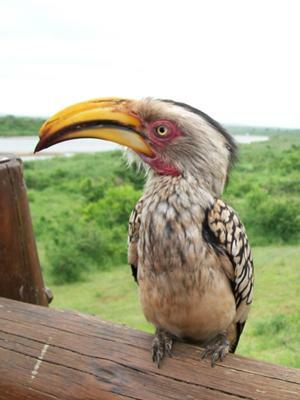 Thanks for your Cheeky Hornbill photo, it's a great close-up photo of the Hornbill with the Sabie river in the back ground.